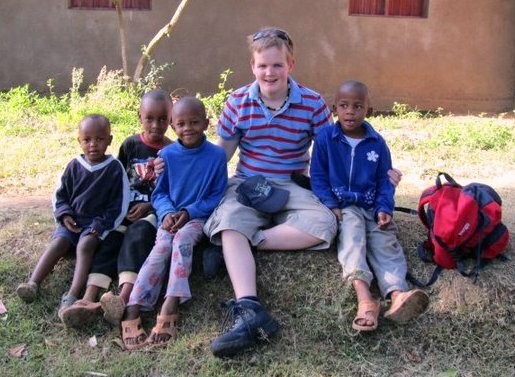 Tanzania volunteer Will Koops tells us all about his time out in Tanzania after one month- thanks a lot Will, we look forward to your next instalment! As promised I am now writing my newsletter after one month of being out here in Tanzania. The weather is constantly hot during the day and the heat is replaced by a nice breeze in the evening. We arrived safely over 4 weeks ago and we were a group of 13 volunteers. As soon as we arrived we immediately started looking around all the different villages in which we were to be placed. Mine was saved till last and I immediately liked it!!! For the first three nights we stayed in a hotel while we got used to the surroundings. There are four villages in which our group of volunteers was being placed, all with different types of schools and facilities. Our house is owned by the school and we live in the staff quarters. We have frequent visitors which are mostly the children of the teachers who are always helping us. Our house has a good size kitchen, a large living room and two reasonable bedrooms and then an enclosed courtyard. On the other side we have a bathroom with a working shower and two small storage rooms. Teaching out here is challenging, but the students and I get on very well and they even ask for me when taught by the other teacher. They can’t quite remember my name and call me Mr Willy. 50 children to one of me is not easy, never mind the language barrier. By the end of the first week I ended up teaching a entire year group English and I even do some geography which is great fun and very nice to be teaching different year groups. School starts at 8.00 and finishes at 2.30 and I can then stay on for lunch. This means that if my lessons finish early we have most of the afternoon free and often go into town which is only a 40 minute walk away. We also have a great selection of local vegetable stalls in which you can buy tomatoes for about 2 pence!!!! At the weekends we usually meet up with the other volunteers and this is when I often go to the orphanage where some of the girls are (I get treated like a human climbing frame here!). As it is quite far out we often stay the night so that we can make the most of the morning. Or we go into town or sometimes do activities such as this Saturday we went for a very long walk over some huge hills to see some amazing waterfalls. It really was worth the 15 km walk. Once a week I teach Mads’ children (she is our lively and energetic rep!) which entitles me to a hot shower and a cold drink which are real luxuries and I also get a small amount of money which helps fund the nights out. The locals are so friendly and our neighbour Mma Mlay takes on the role as our Tanzanian mum. We are also visited by our friends the monkeys who bang on our tin roof and on the first morning scared us half to death as we did not know what it was. I am having such a great time out here.